We deliver to the lower 48 contiguous states. Hawaii and Alaska are not current service areas. How to lower shipping costs. 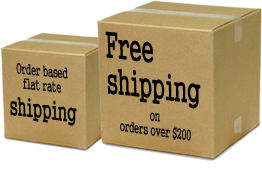 To assist our customers our flat rate shipping is per order. So as the total order amount increases your shipping costs to our customers are reduced, with an exception for freight items. So please take a minute to browse our website you may find some other parts and accessories you can use with your outdoor equipment. Freight items (size or weight exceptions). Some items we sell are too heavy or too large for standard ground shipments and will be shipped freight. These items include engines, some harvester bars, large tools, racks, heavy oil canisters and other heavy / large sized items. To see the complete list click here.